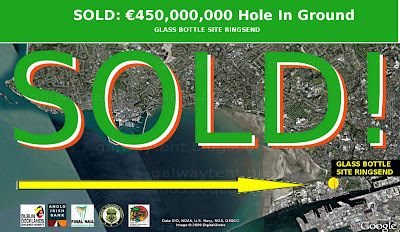 The Galway Tent Blog: NAMA Gearing Up For Irish Glass Bottle Ringsend Scam? NAMA Gearing Up For Irish Glass Bottle Ringsend Scam? 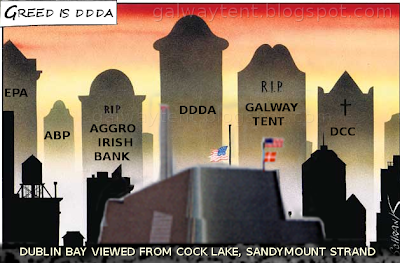 In September 2008 the patriotic Galway Tent Cartel ordered Mr BIFFO not to liquidate Anglo-Irish Bank nor any of the rest of the Cartel. The Cartel even told Mr BIFFO how to spell systemic and billion but did not explain the big words. After Mr BIFFO recolonised Irish taxpayers with the €490 Billion commitment he was given his customary bag of chips. The Tribune reports Anglo-Irish Bank is doing some more financial stunts concerning the Glass Bottle Site in Ringsend. Isn't this in order to finesse selling the hole in the ground to the taxpayers using the NAMA scam. Next some spiel about "bankrupt-developers" being forced to sell their trophy houses and their trophy wives will be printed by The Irish Times in order to fob-off the mortgaged masses. 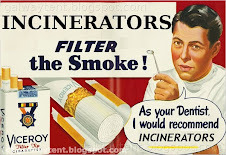 The Traitor Gormley might even do a jobs announcement - omitting any mention of the firing of the 300 IGB recycling-workers, facilitated by the DDDA-Anglo-Irish patriots. Without the help of Mr. Gormley's DDDA Planners Autocracy the IGB site's current and foreseeable value is zero. The DDDA Planners Autocracy is in the final stages of a Sham Poolbeg Scheme process which will end up costing taxpayers hundreds of millions, killing jobs, shutting schools and hospitals. 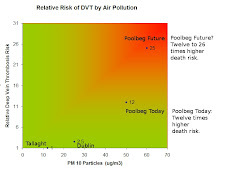 DDDA's buddies in Dublin City Council, including €75K payoff councillors, will send many more people to hospital once the iconic Poolbeg Incinerator - "Europe's Largest" - fires up its uncontrollable toxic particle generators (PM 2.5's, PM1.0's). NAMA's sponsors like to confuse taxpayers by using big opaque numbers such as the ninety billion euro they plan to scam from taxpayers 'to save the economy'. That's €60,000 of extra taxes per worker (2011 full-time headcount equivalent). Such money would be better invested in high value intellectual property. Its more useful to look at an example of just one site buried inside that €90 Billion zombie banking number. According to honest DDDA-Anglo-Irish-Bank the Glass Bottle hole-in-the-ground speculation has an alleged book value of €450 million. The site's real value is between zero and €45 million at most. However when the DDDA Autocracy hands out the planning permission for the future-slum to its co-conspirators, sorry co-investors, the Autocracy will declare the site's value is €299 million. This means the honest NAMA gentlemen can diddle the taxpayers by paying 'a robust 66.6%' or 'only' €199 million of taxpayer's cash for the site. The false book-keeping balance of €251 million is also diddled from the taxpayers in the "systemic Anglo-Irish Bank" scam of September 2008. The Galway Tent Cartel can easily use the national database of phone calls, emails and IP addresses to plot all relationships used by Irish TDs. Using this and more subtle methods the Galway Tent Cartel is in a positon to order all the main political parties to be fully on-board with DDDA's Patriotic Poolbeg Scheming, going forward. Including The Traitor Gormley. None of the political 'elite' have provided a more realistic scenario than that outlined above. This is very curious. PS: There is little validity in the childish rumour that the NAMA was first going to be named the Bonzo McNamara Bank. Just plain NAMA is more subtle - after all patriotic NAMA has not been set up to rescue 'developers'. ANGLO IRISH Bank is to ask the Government for a further cash injection of up to €2.5 billion in order to keep its capital base above the minimum levels required under the terms of its banking licence. A spokesman for the Department of Finance said yesterday that it had not received any official contact from Anglo Irish Bank in relation to the need for further cash. Anglo declined to comment. However, it is understood that senior executives at the bank are preparing to ask for €1.5 billion by the end of May in order to satisfy capital requirements set by the Financial Regulator. The bank’s bad debts have grown larger than was projected when the bank was nationalised in January and a further deterioration in the loan book means the bank may have to ask for an additional injection of €1 billion over the next 12 months, the Sunday Times reported. The bank is close to completing its review of its loan book, which it is conducting under the supervision of the regulator and PricewaterhouseCoopers. Anglo Irish Bank executive chairman Donal O’Connor is finalising a new business plan for the lender and how much cash is invested in the bank will depend on whether the Government believes it has a future as a trading bank. Most of Anglo Irish Bank’s loan book is likely to be eventually acquired by the National Asset Management Agency (Nama). The Government has already committed to injecting €7 billion into AIB and Bank of Ireland and further requests for capital will put extra strain on public finances. The Department of Finance is due to publish Exchequer returns data for April tomorrow, which is expected to show a widening in the Exchequer deficit. AIB’s economic research team has forecast that the deficit will widen from €3.7 billion as of the end of March to €8 billion at the end of April. Anglo-Irish Bank's chairman previously worked at DDDA and at P-W.C.
Corporate Governance me arse. Perception is reality. Is this DDDA-Anglo setup a multi-billion fraud on the Irish taxpayer? Or is it FF-Green Patriotism? EVERY deal has winners and losers. The South Wharf deal will probably end up costing the taxpayer hundreds of millions of euros, but it also made the sellers rich. They are the investors who backed financier Paul Coulson and the state-owned Dublin Port Company. Coulson and Dublin Port split the proceeds of the €411m sale in 2007, with Coulson's company, South Wharf, earning €273.6m and Dublin Port getting €138.4m. Their windfall followed a lengthy dispute between Coulson's company, which was the site's leaseholder and Dublin Port which was the site's freeholder. That battle raged for years until two parties finally sold the land in 2006. The biggest single winner was 57-year-old Coulson, who earned more than €30m from the transaction through his 3.8pc stake in the publicly listed South Wharf Plc and his one-third stake in long-time investment vehicle Yeoman. The rest went to the investors in the companies he runs, including about 1,300 small shareholders who had stuck with him through thick and thin. Coulson came to control South Wharf Plc, which owned South Wharf's leasehold, when he applied his legendary skills to dismantling Ardagh, a publicly listed company that owned Irish Glass as well as glass companies in Italy and Britain. Back in 2002, few quite understood just how valuable the Irish Glass bottling plant would prove to be when Coulson took the company private in a complex deal that led to the loss of 375 jobs at the bottling plant. That demerger was challenged by Coulson's long-time rival Sean Quinn, who tried and failed to gain control of Ardagh with a rival offer to shareholders. The two men have long battled to win share of the competitive glass market here and overseas. Quinn's glass-making operations ate into Ardagh's UK profits when Quinn opened a glass factory near Ardagh's factory, close to the English city of Chester. That rivalry took another twist last month when Quinn's plant was served with a court notice to cease production following a High Court action by Coulson. Coincidentally, both Coulson and Quinn have been clients of Anglo Irish over the years. Quinn's expensive stake-building in Anglo Irish have been well documented in recent months. Coulson turned to the bank in 2007 when Ardagh bought UK glass maker Rexam with a €320m debt facility from a syndicate of banks led by Anglo Irish. Coulson also had a business relationship with former Dublin Docklands Development Authority chairman and Anglo Irish Bank director Lar Bradshaw. The two men are investors in a development in Sandyford together with former Anglo chairman Sean FitzPatrick. The other beneficiary was Dublin Port Company which is a private limited company wholly owned by the State. The company, which is responsible for the port's management, employs 161 staff and handles over 50pc of all Ireland's imports and exports. The company's windfall meant that the port was able to expand and invest, helping trade at a time when exports are falling. Our 'bad bank' blueprint is poised to distort the Irish property market for a decade or maybe even for an entire generation. But it's not too late for a re-think. The country's 20 largest property developers will apparently be deliberately shielded from collapse by the State's new 'Bord Bail-Out' over the next 10 or maybe 15 years. It will be all hands to the pump to avoid 'fire-sales' of landbanks at knockdown prices as the State's new National Assets Management Agency (NAMA) stops the rot of deteriorating land prices. This will hopefully put a floor under property values, thereby stabilising house prices at or around current levels. Good news for homeowners perhaps, but a mixed blessing for buyers. And political dynamite. Any move to systematically ringfence big developers is bound to draw serious flak. One law for the (erstwhile) rich, but what about the rest of us -- or words to that effect? Or -- how about: the Constitutional rights of private property are one thing, but what about the 1916 Proclamation's promise on "cherishing all the children of the nation equally". And many commentators feel it's a pound to a penny that the taxpayer will be left to pick up the tab. National Treasury Manage- ment Agency chief Michael Somer's admission that he has "no idea" how NAMA will work might seem bizarre at this stage of the game. But it should really come as no surprise, given the fog of uncertainty hanging over our economic future. But Mr Somers got it spot on when he warned that the ultimate winners may be neither banks nor developers -- rather (you've guessed it) the legal profession and a payday bonanza for lawyers that will put Tribunal takings in the halfpenny place. Our top developers have already formed ranks under the Construction Industry Federation (CIF) to see how best to minimise NAMA's impact. Make no mistake, their backs are to the wall and they will fight tooth and nail any asset stripping move. The Government, meantime, is caught in the headlights of the banking crisis -- mesmerised and frozen to the spot. You may think that Mr Somer's remarks fall into the GUBU category -- grotesque, unbelievable, bizarre, unprecedented (more so in line of official insistence that NTMA has been fully briefed from the outset). But they should instead really serve as the ultimate reality check. Is NAMA a necessary evil? Or a disaster waiting to happen? Either way, the entire saga has raised far more questions than answers to date. We can afford to take nothing for granted -- least of all that our key administrators have any idea what they are doing. The UL experts argue that the Government should now examine other banking solutions -- particularly the German approach. "The key difference between the German model and the proposed NAMA is that the German plan diverts the burden of adjustment to the banks and to shareholders (and not putting it on the already overburdened taxpayer, as does NAMA) and therefore minimises risk to the taxpayer," they assert. Instead of end-loading NAMA at the expense of the taxpayer, any assets found to be loss-making at the end of the day should surely be diverted from the bank's own shareholders/investors. With the fine detail of the NAMA legislation still at the drafting stage, there is still time for the two Brians to go back to the drawing board. If they don't, the Fine Gael Recovery Bank and Labour's nationalisation plans will only win more votes. jmcmanus@irishtimes.com, Monday, May 25, 2009. [...] The Dutch-owned bank’s relentless pursuit of debts of €23 million owed by property developer Paddy Kelly and his family stands in stark contrast to the more “supportive” stance that has been adopted by the bigger Irish-owned banks as regards their developer clients. Their forbearance of course is due entirely to self-interest. The last thing AIB or Bank of Ireland want to see is the entire portfolio of some bankrupt property developer dumped on the market by a liquidator. Not only would the banks have to write off their losses on that particular developer, they would have to write down all the other loans extended to all the other developers to reflect the value of the prices being achieved by the liquidator. It’s the quick and dirty version of what the National Asset Management Agency has been set up to let the banks do: recognise and absorb their property losses. But doing it outside the warm embrace of the taxpayer means almost certain bankruptcy for the banks themselves. Hence the need for the State to step in with taxpayers’ money to help the banks find a way out of the stalemate that they have engineered for themselves. ACC appears to have no such worries,[...] Nobody likes to be taken for a fool. AIB and Bank of Ireland do not have this luxury. Their fear is that once one of the big developers enters formal insolvency, they will all go, so intertwined are their business interests. Equally, so complicated and incestuous are their banking relationships that one of the big banks has little to gain by forcing a large developer into bankruptcy.As a result, Kelly and most of his peers are effectively on life support, with the banks taking the view that their best chance of seeing any of their money is to help their clients work through the problems. Equally, the banks could probably cope with Paddy Kelly going bust and the arrangements put in place could be absorbed by Nama once it is up and running. The bigger question is what will happen if ACC forces Kelly into a formal insolvency process which in turn forces a couple of others over the brink – all before Nama is ready? The answer is a truly awful mess. But it also serves to hasten the inevitable, and that is not necessarily a bad thing. The banking system is close to paralysis because of fear as to what will happen once the process of confronting the reality of the bad debt problem begins in earnest. The comments two weeks ago from Michael Somers of the National Treasury Management Agency – which will be responsible for Nama – to the effect that he did not know how it was going to work, are open to the interpretation that the State is equally terrified of the consequences. The property developers themselves are adding fuel to the fire with talk of legal challenges and the like. It’s very easy to see the whole process of setting up Nama drift out until the new year. The temptation to step back from the edge is intense. If it takes the precipitous collapse of Paddy Kelly to force everybody to jump into the unknown and get on with cleaning up the mess, then it is to be welcomed. We may yet have reason to thank the Dutch. WE ARE THE NAMA REPUBLIC. Developers in helicopters lying bankers to rugger internationals. Using their corporate boxes to get them into Croker to be entertained by tax avoiders like Mr. Hewson and his chums. And then when the 'business model' fails, socialize the losses. We are a capitalist society towards those who work, and a socialist society towards those that control business. When private enterprise fails, it gets bailed out. When people fail they get locked up for not paying their debts. NAMA must be stopped. It is a very serious issue. Write NO TO NAMA everywhere you go.